Frank Lampard expects a tough test from Norwich on Wednesday. Frank Lampard says he's keen for last Saturday's defeat at Bolton to be merely a blip as Derby County prepare to host Norwich on Wednesday night. The Rams had been in good form prior to Saturday's 1-0 loss, with wins against Brentford and Manchester United to their name in the previous seven days. And Lampard says that, unlike the defeats at Millwall and Rotherham earlier in the season, there were enough positive signs at Bolton to mean he's not panicking about the prospect of a drop in form. He said: “This was different to Millwall and Rotherham in that we didn’t know what to expect there and didn’t cope with it, whereas at Bolton we controlled the game, they scored against the run of play and with 75 per cent of the possession and lots of shots I can’t fault the lads’ efforts to try and get back into the game and their commitment to the cause. The quality just wasn’t there and we weren’t as clinical where it mattered as we had in the Brentford and Man Utd games. “But I’m not as bothered about the defeat as I was the Millwall and Rotherham so it shouldn’t break our stride. We had a great week before that so we just need to keep on the same path – this is new for all of us and days like that will happen. Lampard expects a tough test from Norwich who have won four of their last five league games. 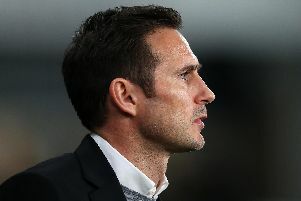 Lampard added that the Carabao Cup fourth round draw which sees him prepare to take the Rams to Chelsea, the club where he is regarded as a legend, was one that he was delighted to see come up. The win over Manchester United in the last round had many predicting a trip to Stamford Bridge was written in the stars, and so it proved. He said: "It’s a great draw for the club for many reasons and an emotional one for myself, Jody Morris and Chris Jones. We were in the car together on the way back from Bolton when the draw was being made and we couldn't believe it. “I’m pleased but also delighted for the players because it’s another chance to reproduce what we did at Old Trafford. “It will be a big ask because big teams can take games away from you no matter how well you play, but I want us to go there and play with confidence again and a belief in ourselves. There are a few games before that but it’s a nice carrot waiting for the squad at the end of the month.